ISO 9001:2015 is a widely used standard for quality certification and also one of the most stringent. This standard ensures that all aspect of a contract manufacturer’s business are well-managed and continually improved, including key processes, management roles and responsibilities, ISO 9001:2015 documentation, customer satisfaction, employee training, vendor performance and internal audits. 1. Review ISO 9001:2015 documentation: Ensuring that all company ISO 9001:2015 documentation, from packing slips to check sheets to invoices is thorough and accurate is essential to completing an audit successfully. Common elements to monitor include missing signatures, incomplete fields, and outdated revision levels. Also, check the handwritten notes on drawings and work instructions – these can be triggers that indicate a need for a new revision to the document. 2. Communicate: During the ISO 9001 audit, employees should answer questions openly and honestly. If they do not know the answer to a question, or if the question is not related to their role, they must inform the auditor. Referring an auditor to a Department Manager or referencing where the answer can be found is always acceptable. Providing misinformation under the guise of being helpful, or speculation on hypothetical situations, can potentially make things difficult for everyone involved. Employees should focus on answering the questions at hand. 3. Involve Everyone: Employees should be encouraged to contribute to the QMS and informed of improvements generated from their input. This is a powerful motivator and enhances a culture of employee engagement. When one has a stake in the success, they are more motivated to participate. It also makes one more knowledgeable of the QMS to enhance the processes in their departments. Why is ISO 9001:2015 Certification a Good Idea for Your Organization? Improvement of your credibility and image – Because ISO 9001 is an internationally recognized standard, it has become the basis for creating a quality management system around the world. When a company is looking for a supplier, it is often necessary to have a QMS based on ISO 9001 to be considered. Getting ISO 9001:2015 Certification can be a powerful marketing tool. Improvement of customer satisfaction – One of the principles of quality management that underlies the ISO 9001 requirements is to improve customer satisfaction by planning and trying to meet customer requirements. Improve process integration – By observing the overall process interactions through the ISO 9001 process approach, improvements in efficiency and savings can be found more easily. This is done by eliminating the waste that might occur during the process transfer. Improve your evidence for decision making – A second quality management principle of ISO 9001 is the need to use evidence-based decision making. In addition, by monitoring the process that is improving, you can see how much improvement has occurred based on the data. Create a continual improvement culture – Continual improvement is a third quality management principle of ISO 9001. By adopting this culture to improve organizational processes and result, you will find efficiencies and cost savings, including the use of systematic processes in case of problems reduce the impact of the problem and increase the speed of recovery. By making this continuously, improving year after year, the company can see continuing benefits from this. Employees Engagement – Employees who participate in the process improvements they work with are happier and more engaged. Engaged employees are more productive and will help the company better improve and save, especially when they understand how the quality of the process depends on them. Does ISO 9001:2015 Procedure Document Require for Addressing Risks and Opportunities? Identify the risks and opportunities – what should be addressed to ensure that your QMS does what is necessary, is based on the desired results, prevents or reduces the results of the problem and obtains an improvement? Plan your response – What actions should you take to address the risks and opportunities identified? Integrate into your QMS – how can these plans be adopted and adapt to the usual activities so that they can happen easily? Evaluate effectiveness – How will you know if your actions have worked, or need to be updated? This involves analyzing the information and management review to assess the effectiveness. 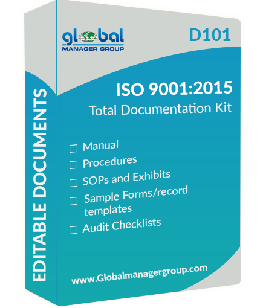 Do you need a document ISO 9001:2015 procedure? It is important to note that there is no mandate for documented information for any of these steps. The standard itself does not state that it is necessary to document ISO 9001:2015 procedures that concerning risks and opportunities, just that you must perform the processes in the section above, as well as update the risks and opportunities as an outcome of process non-conformities. For instance, you could choose to assess your risks and opportunities at a management meeting, identify a risk, decide what you want to do and make sure that employees who are executing the QMS process are aware of what they need to do and you could then claim that you are compliant with the ISO 9001:2015 requirements, even if none of these are written. Therefore, in accordance with ISO 9001: 2015, a documented procedure is not required, but your company may have a different need for documented information and records regarding QMS risks and opportunities. How to Write a Good Quality Policy? One of the first things to do when implementing a Quality Management System using the requirements of the ISO 9001:2015 standard is to write a Quality Policy for your company. Quality policy should be a brief statement that shows a commitment by top management to the quality management system. One reason to create and implement a quality policy for your organization is to ensure that all staff are aware, aligned and supported their intentions on quality management. Another reason is because it is a requirement of ISO 9001:2015 Certification. In some ways, it seems a simple process; however, in other ways, making sure that the policy is effective in helping your company succeed can seem like an overwhelming task. You may be wondering: what are the important things to consider when creating the quality policy of our company? The key to starting any quality management system is to make sure that you understand customer requirements. If you want to successfully promote your QMS to improve customer satisfaction, it is essential to ensure that you understand all the requirements you need to meet to achieve it. These requirements may come directly from customer specification, through industry standards, or even through legal requirements related to their products or services. Making sure you have all these necessary inputs will help you ensure that your quality policy focuses on the important elements to achieve customer satisfaction. The quality policy is the main objective of the quality management system and is designed so that all employees can use it as a reference point for their work. In this case, it is important to gather input from all areas of the company to ensure that the Quality Policy is applicable to all those areas. In order to do this, it is important to get the input of people in the areas who will need to apply the policy. The standard does impose some requirements on the Quality Policy that are important to note. The quality policy must demonstrate the company’s commitment to meeting the requirements and improving the efficiency of the QMS. With all of this information in mind, you need to draft a policy that can guide the organization and provide direction to create quality objectives It is said that a good quality policy is simple, concise and easy to remember when under pressure. It is important that all employees not only know the policy, but also understand what it means and how their work supports compliance with the Quality Policy. Why Have Procedures? What are the Mandatory Procedures for ISO 9001:2015? Why have procedures? Some would answer this question by providing very long lists of reasons why, these lists are sometimes not useful. They are too long to remember and absorb them, and there is too much overlap and redundancy. There are four very basic reasons that demonstrate why we should develop procedures to document important process. What to cover in Mandatory ISO 9001:2015 Procedures? 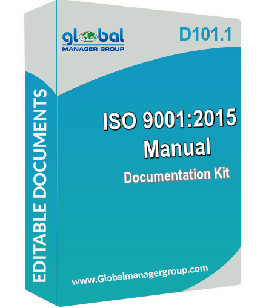 These mandatory ISO 9001:2015 procedures are specified by ISO 9001 and are included in quality manual template. There are the six procedures that are mandatory to be documented. Organization need to ISO 9001:2015 document these six procedures. This doesn’t mean simply will go away with just these six, the ISO 9001:2015 procedures you wish can abundantly rely upon the scale and complexness of your organization, these six but are those that you simply should have. This is the procedure for checking the archiving of identification, protection, storage and deletion of records by the owner of the process and also keeping records in a specific location. The established records will be checked to provide confirmation of compliance with the requests and the effective functioning of the quality management system. The purpose of the ISO 9001 internal audit is to assess the effectiveness of the quality management system and the organization’s overall performance. Your internal audits demonstrate compliance with planned arrangements, e.g. QMS manual, procedures or process maps and that the planned arrangements are implemented and maintained. As regards the ISO 9001 standard, the documents are necessary and the records of the non-conformity problem are kept in order to identify them and act in this way. This is a procedure that ensures that the testimonial of the useless product and no action is performed and documented procedure is established to define the controls and the related responsibilities and authorities to deal with non-compliant products. A corrective action should be considered as a reactive response to a problem since it is taken when a non-conformance is detected or upon receipt of a customer complaint or other event. Your organization should first contain the problem and then determine its root cause in order to take appropriate corrective action to prevent the problem’s recurrence. The Preventive actions are pro-active – something could go wrong and these are actions taken to prevent it from happening, or to prevent it from becoming too severe. If something has already gone wrong, it is a non-compliance that is addressed with corrective actions. ISO 9001: 2015 requires documenting the preventive action procedure. Furthermore, it is necessary to keep a record of the identified preventive actions and actions taken. ISO 9001:2015 Consultant – What Services Can Offer to Your Business? Do you know the importance of having an experienced ISO 9001 consultant? In real terms, ISO 9001:2015 consultant services help a business to save both money and time, thereby helping your organization to gain an edge over the competition together with several other advantages to seek as well. An ISO company ensures ISO 9001 quality management system (QMS) which can be very helpful in improving your company’s prospects. To achieve advantages of ISO 9001:2015 Certification, a business should have the knowledge to implement the ISO 9001 in right manner. ISO 9001 Consultant offers a number of services. What Services ISO 9001:2015 Consultant Provide? The ISO 9001 quality management system standard can be a hard document to understand. It is written in quasi-legal language and points out requirements in very general terms. This is deliberately so, as it is meant to be applicable to all types of business activity. Quite a few companies have issues interpreting it to their organizations. An experienced ISO 9001 consultant can help you apply the standard to your specific business processes. Before applying the ISO 9001 standard to your business, you need to know what is missing between your existing business practices and controls relative to ISO 9001. The ISO 9001 consultant will provide you with a detailed verification report that shows gaps in your company, along with their recommendations. The main emphasis of the ISO 9001 standard is on effective planning, operation and control of thrust all relevant quality management system processes. This is probably the longest and most challenging part of any ISO implementation project. Here is where using external ISO 9001 consulting will significantly help in answering these questions, provide required focus and facilitate implementation. The latest ISO 9001:2015 standard reduces the attention on documentation and maximizes its attention on effective planning and control. Sufficient ISO 9001:2015 documentation is however needed for many business processes in order to ensure consistent application of effective controls. An export ISO 9001 consultant can help your organization determine where it is needed, how much and how it should be documented. To be certified and remain so, the ISO 9001 Standard requires your organization to plan and conduct an internal audit program of its quality management system. In these days, many organizations are short on resources, internal audit expertise and employee availability outsource the upkeep of their internal audit programs to ISO 9001 consulting firms. The ISO 9001 standard expects your quality management system to be dynamic and work towards continually improving the effectiveness and efficiency of your organization and enhance customer satisfaction. Many ISO 9001 consulting firms have diversified skills and experience in strategies and methods of continuous improvement. What is ISO 9001:2015 Awareness Training and its Benefits? ISO 9001 training comes in several varieties, from training to help support the creation and maintenance of a quality management system for a company, to training of people who will be certified for auditing the QMS of companies for certification bodies. When implementing ISO 9001, it is essential that everyone knows what they are doing and why. ISO 9001 may start from the top management, but it is essential that all employees on board for its implementation are successful and effective. This is why everyone should be given some training in ISO 9001 awareness. ISO 9001 training provides a structure and set of principles that makes sure there is a reasonable approach to the management of an organization to constantly satisfy the requirements of clients and other investors. It delivers the basis for operative processes and active people to supply a quality product or service at all times. ISO 9001:2015 Awareness training helps participating organizations to gain better knowledge of what a quality management system is, how the requirements of ISO 9001 is implemented and how to audit your quality management system. The training is suitable for the needs of new quality managers and organizations implementing ISO 9001 for the first time. Helps reduces operating costs A continual improvement of procedures and resulting operational productivities mean money saved. Provides legal compliance Organization will understand how legal and supervisory requirements impact the organization and its clients. Provides improved investors or partners relationships improving the perception of your organization with clients, suppliers and employees. Offers client satisfaction by supplying products that constantly meets client’s requirements. Allows organizations gain improved risk management; having greater stability and traceability of products and services denotes that problems are avoided and rectified with ease. Give organization the ability to win more business. The Obtaining conditions sometimes require ISO 9001 certification as a condition to deliver.